The Lower Elementary program at Summit Montessori School comprises first, second, and third grades. The three grades are unified in a multiage classroom, so that the children spend three years with their peers, establishing friendships and;developing cooperation and leadership skills while mentoring those in the younger grades. Within the Montessori elementary curriculum, all disciplines (subjects) are viewed as interrelated, united by a framework of understanding that all living and nonliving things are connected. While the children focus daily on specific disciplines in order to gain appropriate skills and competences, they also emerge from their elementary years with a fundamental understanding of the interconnectedness of all disciplines. This awareness supports their skills of analysis, critical thinking and problem solving, also;enhancing their self-awareness as global citizens. Three major disciplines are incorporated in Summit’s Lower Elementary curriculum: (1) Mathematics (including arithmetic, geometry, measurement, and probability), (2) Language (including speaking, listening, writing, reading, and grammar), and (3) Cultural Studies (including geography, history, and science). Lower Elementary students also regularly engage in Music, Visual Arts, Physical Education, and Spanish. As emphasized in our Mission Statement, Summit is dedicated to developing life-long learners. The Lower Elementary years are a time of exciting exploration and vital skill-building. First, second, and third graders benefit from talented faculty who care about their students and ensure that each child owns his or her work and achieves his or her potential. As they graduate to our Upper Elementary Program,Summit students have been given outstanding preparation and the capacity for advanced learning. They graduate with their thirst for and love of learning intact, eager to take on the next level of challenge. Elementary-aged children are all about defining who they are in relation to their peers and who they are in the larger world. The strong “I” that they have developed through the early childhood years continues to develop, but in the context of “we”. Elementary-aged children are in a new developmental phase, one in which a major driver is finding a sense of place in the social grouping, in the classroom, and in the world. 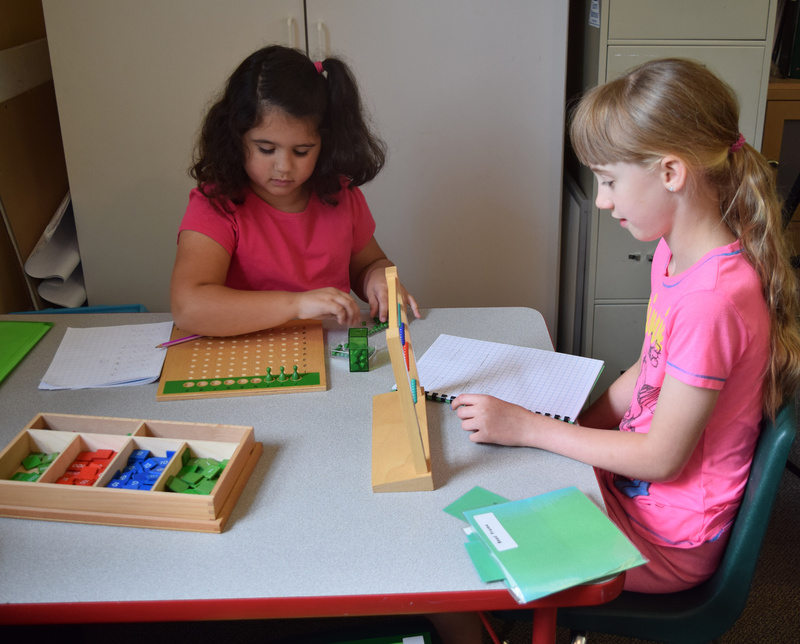 The Montessori Math curriculum is introduced and practiced using ingenious materials that lend concrete form to abstract concepts (Dr. Montessori referred to these materials as “materialized abstractions”). The combination of Montessori’s sequenced, hands-on approach and carefully designed materials brings math to life for the child, affording great opportunity for understanding math relationships, perceiving the inherent patterns in the number system, and engaging in active problem solving, all the while giving the child a solid foundation in the basic math operations of addition, subtraction, multiplication, and division. Materials used in the Lower Elementary Program directly build from those experienced in the Children’s House, progressing from this concrete foundation toward ever more abstract thinking and complex tasks (multiplication of decimals, squaring and cubing, and long division being examples). Children also develop skills with fractions, telling time, exchanging money, weighing, and measuring. Children learn and practice math facts daily, using timed tests and appropriate materials, ideally progressing through memorization of tables by the end of the Lower Elementary Program. Children study and experiment with types and attributes of line relationships, angles, regular polygons, and circles, culminating in the study of congruency, similarity, and equivalence. The Language curriculum incorporates both Montessori materials and strategies generated through “best practices.” Our reading curriculum includes a balance of phonics and word study using programs such as Guided Reading, Read Aloud, Shared Reading, Independent Reading, and Literature Circles. DIBELS (Dynamic Indicators of Basic Early Literacy Skills) is used to identify areas of language challenges and opportunities. Reading is assessed frequently to identify “just-right” and “instructional” levels using a Guided Reading assessment. Students use nonfiction books (paying particular attention to the elements of nonfiction - title page, table of contents, index, and glossary) to conduct research on different aspects of our country studies, including geography and zoology. Students create project boards with visuals and text and present this information to their peers and the greater community. In the Lower Elementary classroom, there is a strong emphasis on helping the children form letters correctly and developing neat and readable handwriting. Throughout the year, the children write daily, engaging in a Writer’s Workshop format. They choose topics freely, are presented lessons that expand on the craft of writing, confer with teachers and peers, edit, publish, and present. Both narrative and expository styles are emphasized. Our spelling program is developmentally based, and elements of both the Wilson and the Orton-Gillingham methods are incorporated. Spelling assessments are performed periodically using Word Journeys. Grammar work which builds a foundation for more complex writing focuses on parts of speech and sentence analysis. The Lower Elementary students explore the continents through map study, examining geological and topographical features and the interconnection between biomes and populations of flora, fauna, and societies. Through studies in political geography children learn the names of continents, countries, and states, as well as capitals and their flags. Students are exposed to the interrelatedness and interdependence of people for economic survival, tracing goods from source to consumer. Our studies include composition of the Earth and its elements of land, air, water, and fire. Lower Elementary students are fascinated with the big picture of life, expanding their world view from the particular, discrete and concrete (Children’s House) to the universal. Appropriately, during the Lower Elementary years students experience theories of the formation of the Universe and the Evolution of Life. This broad view is based on Maria Montessori’s understanding of the stages of child development, where 6-9 year old children are curious and asking: Who am I? How do I fit in? We offer lessons on the Universe first, and eventually hone in on their places in the world. Students explore timelines and early civilization through the lens of the basic “fundamental needs” (clothing, shelter, food, transportation, communication, spirituality/creativity, and protection). Our cultural studies include American history and ancient cultures of the world. They also expand the study of fundamental needs to modern society. The Science curriculum, including botany and zoology, is presented to give the children a sense of the “whole” picture of the forms of life on Earth. Children learn basic characteristics, parts and vital functions of living organisms, and they explore and compare their features. Zoology studies are organized beginning with the differentiation of animals into vertebrates and invertebrates. Children further classify animals into kingdom, phylum, and class. Botany studies are organized by kingdom, examining ancient bacterial life, single-celled plants, fungi, and more complex plants. Aspects of physical science include states of matter and forms of energy. Children use the scientific method to perform experiments, make observations, and reach conclusions. Elementary-aged children are all about defining who they are in relation to their peers. The strong “I” that they have developed through the early childhood years continues to develop, but in the context of “we.” Elementary-aged children are in a new developmental phase, one in which a major driver is finding a sense of place in the social grouping, in the classroom, and in the world.